I'm going to festoon these numbers with a lot of caveats and explanations in a moment, but I wanted to point out one important figure first before we drill down. In 2015, adult Oregonians drank an average of 6.4 gallons of locally brewed beer. That's a per-capita rate, and includes all non-beer drinkers--every Oregonian 21 and older. That's just beer brewed here. Since Oregon no longer has any industrial plants producing mass market lagers, 100% of that local beer falls into the "craft" segment. If the rest of country consumed beer like Oregon, the craft segment would be 48 million barrels--and it's currently just at 21 million. But even that understates things, because these numbers don't capture the craft-segment beer we drink from other states. If the rest of the country consumed craft beer like Oregon, the craft segment would currently constitute somewhere between a quarter and a third of the entire market. There's not a single reason in the world I can think of why this is not the future of beer. And that's why companies are paying a billion dollars for 150,000-barrel breweries. But now onto the numbers. I'm not going to go into enormous detail here, because the system the OLCC--the agency that tracks beer sales in Oregon--uses to track sales began to fray badly in 2015. For some reason, sales of the fourth-largest Oregon brewery just vanished from the list in October. The Craft Brewers Association Alliance moved their storage warehouse offsite in the fall, and that somehow caused the OLCC to stop tracking their numbers. Folks at CBA gave me a rough update on their figures, and I calculated 10 Barrel's sales based on the existing year-to-date figures that went through September to come up with these numbers. Also, the beer for Laurelwood's six-packs is brewed in Washington state and isn't reflected in these numbers. One final comment. 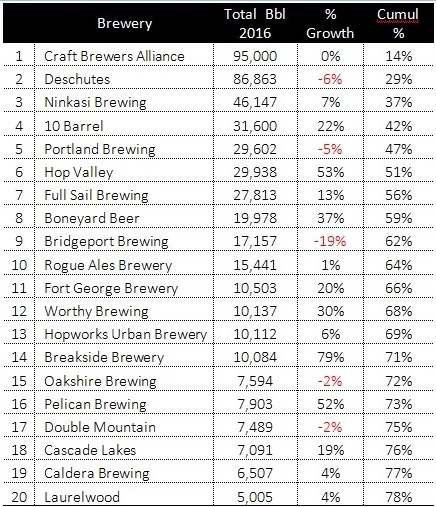 Although CBA appears at the top of this list, Deschutes is really still Oregon's best-selling brewery. CBA's numbers include sales of Kona, Widmer Brothers, and Redhook; listed separately, they'd fall somewhere behind Bend's big dog. Here's the top twenty. As the president would say (sort of): the state of beer in Oregon is strong. would be helpful to indicate which breweries are actually independent craft breweries and which were allied with (CBA is 1/3 owned by ABI) or completely owned (10B is 100% owned by ABI) - while it is not indicative of the quality of beer, it IS important to followers of craft beer. It's like talking about minor league players in a AAA MLB farm team and comparing them to a completely independent regional league - the players MAY be just as good (probably not, but bear with me) but the AAA teams have money behind them and it would be good to have that indicated on rankings like this. I just wanted to chime in here and set the record straight. I can't speak about the situation with 10 Barrel or any other brewery but our (Widmer/CBA) relationship with ABI is a Distribution Agreement. ABI has no input regarding the way we brew, how we go to market, etc. We actually pay ABI for access to their network of wholesalers. We have to compete in the marketplace just like any other independent craft brewer. For example, Shock Top competes directly with Widmer Hefe and is sold by our own wholesalers. It's funny to me how some of our peers complain about competing with the large brewers. Craft brewers are all in the major league now and there's no whining! Thus, I think it would be good to give asterisks to CBA breweries and at least to split them up into their actual breweries. I'm not saying to take them OUT of the ranking, just to give an asterisk saying they aren't entirely independent. @Jeff, after our conversation, I ran some Neilson data* for comparison against this list. To Boomer's point about CBA being broken out, here's how CBA brands ranked in 2015 based on volume sold in Oregon among all craft beer brands sold here (not just those brewed AND sold in Oregon): #2) Widmer Brothers, #19) Kona, #29) Omission, and #32) Redhook. This OLCC data set is bound to become less accurate as a representation of brands that are growing from year-to-year as contract brewing and brewing in multiple states at multiple brewery locations grows. 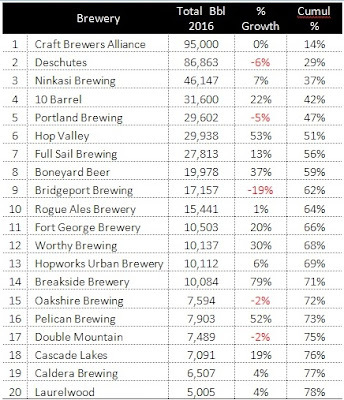 That said, I was somewhat surprised to see that four out-of-state brands: Sierra Nevada (#6), Blue Moon (#7), Lagunitas (#8) and New Belgium (#10) are among the top 10 craft brands (as defined by Neilson) in Oregon based on volume sales. I'm confused a bit because there appears to be a typo when CBA is referenced as the Craft Brewers Association in the fourth paragraph. Why does the Craft Brewers Association have a warehouse in Oregon? Thanks, Colin, fixed. (Just one of those old-brain problems; when my hands type out Brewers A... the next thing they want to type is ssociation.